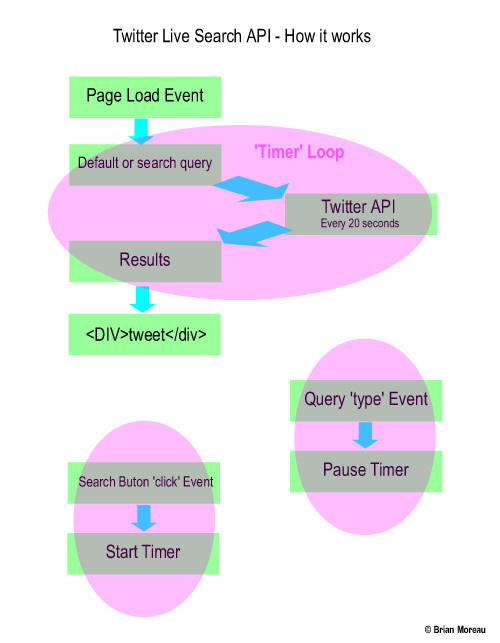 So I decided to build a Twitter Live Search web application based on the twitter Search API. Many of you are asking why for two main reasons. First you can search on twitter anyway and second why search twitter? The first answer is yes you can use the twitter website to search but new or live results are not displayed automatically. You receive a notification about new tweets but you have to click on the new results link to display them. This means you have to continually interact with the page. My application continually and automatically displays new tweets containing your search query without any user interaction. This means you can display the results on a monitor or mobile device and just sit back and watch. This application can also be placed on any webpage, customised and styled to your websites theme. The answer to “why search twitter”, well the alternative is Google but Google mainly returns website pages which are often old news. Twitter is a platform where people discuss current affairs, news as it happens in peoples back yards. News agencies usually publish stories that have first appeared on Twitter. So you can be ahead of your game and get the stories before any news site. It is also very useful if you experience any of the following, specific local emergencies such as floods or earthquakes, mobile network issues, website down faults, hacked websites etc. The instant people experience these problems they often report them on Twitter and if others are having the same problem they too join in the discussion. You are then able to very quickly identify big issues and continually monitor the impact on people as well as when things are safe or good again. The live feed also has a very useful function in business. You can monitor chat about your company, your latest product or service. It can be used to see what people are saying about your event. Even monitor what people are saying in your restaurant. Whoever you are, whatever you do I challenge you to not find this application useful. The example output is quite raw and unformatted but it can be styled to your specific requirements.